I continue to be amazed at the demographic of concert goers when I go to live performances these days. It just doesn’t feel right that ‘hard rock’ lovers should almost all be white haired, balding or looking as though they are on the verge of reaching retirement age. Then I realise - I’m one of them! First album in the box looks like George Harrison’s Concert for Bangladesh. I went to see The Stranglers on their 50th Anniversary Tour and even at the ripe old age of 51 I was considerably younger than most of the other concert-goers. 3 songs in the roadies had to take Jet Black off-stage as he’d collapsed - he is in his seventies after all! I’d recommend David Hepworth’s book 1971 Never A Dull Moment, which picks as its theme the idea that 1971 was the peak of musical achievement. It’s a good book, I agree with him in a lot of places, with obvious exceptions. 1971 was 48 years ago. Us who were teenagers in the 70s are now at least 50 and probably older. Radio 2 should be appealing to us with more 70s content not less. And I know where my Led Zep vol 1 is too. 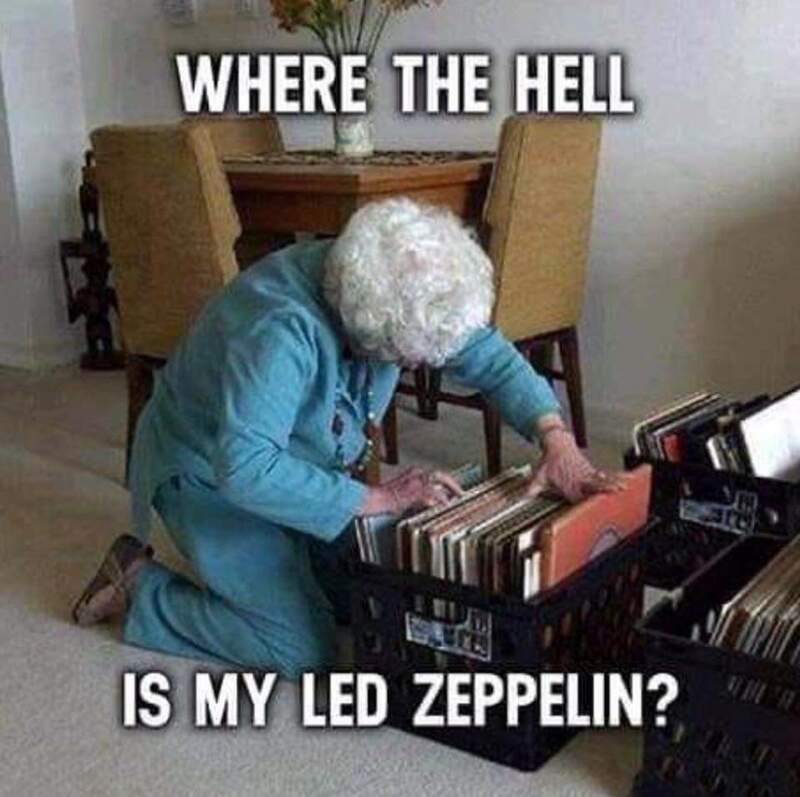 And I know where my Led Zep vol 1 is too. We went to a Cliff Richard concert in Bournemouth back in October and a Frankie Valli concert in December. But the after-dinner entertainment was first class each time ! I went to see Wilco Johnson at Leeds University last year. Queuing up to get in with other blokes in their 50s and 60s I noticed students going past with faces that seemed to read “I hope I never look like that”. I was there too, (great night, by the way), and I know wot you mean, though it’s probably somewhat ironic that in Wilko, we were queuing up to see an old baldy geezer! There isn’t much left in modern day to day life that isn’t rock and roll. Even Alan Titmarsh was rolling those rocks back in the early 90s with edgy Charlie dimmock teasing us with her unsupported borders on Ground Force. At. Jethro Tull tour (or maybe it was an Ian Anderson tour …I forget which!) 5 or 6 years ago (Thick as a Brick 2), Ian stopped at one point and harrangued the male members of the audience about the importance of having our prostate glands checked!